This is a great opportunity for sportsmen who want to combine great bird hunting with saltwater fishing in Mexico’s Gulf of California. 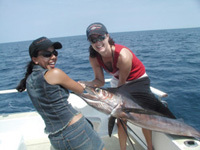 Species include marlin, sailfish, snook and red snapper. Marlin fishing is done in the Gulf of California, with our boats departing from our yacht club in Topolobampo Bay, and includes outfitted sport yachts with a professional crew. Snook and red snapper are caught around the inlets of the bay formed at the mouth of the El Fuerte River and the Gulf of California.